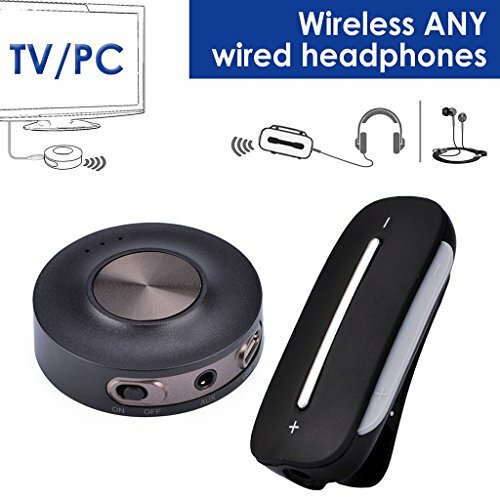 Avantree HT3187 is combo of one Bluetooth transmitter (Priva) III and one Bluetooth receiver (Clipper Pro), which easily turn a pair of normal headphones into wireless headphones and wirelessly stream audio signal from your TVs, PCs and other audio source to your headphones. Both Transmitter and Receiver support aptX Low Latency, which is ideal for watching TV / Movies with no audio delay. We offer 24 Months Warranty for normal use. Live online support, Telephone Support, and email support are available. Video user guide are available also from Avantree site. Any issues or suggestions, contact us via our US toll free No, Intl number, OR email us and 1 business day reply is guaranteed. We are committed to 100% customer satisfaction. WIRELESS FREEDOM: Easily turn a pair of normal wired headphones into WIRELESS headphones using the HT3187. PLUG AND PLAY: This transmitter and receiver set are PRE-PAIRED and reconnect automatically, just turn them on and they're ready to use. NO LIP SYNC DELAY: Built-in aptX Low Latency support in both transmitter and receiver ensure virtually no audio lag - perfect for watching TV / Movies. FREE COMBINATION: An included 3.5mm audio splitter allows you to share the sound from your movie/TV/music with a friend. And both the transmitter and receiver can be paired and used with other Bluetooth supported devices. GREAT COMPATIBILITY, WORK RANGE & PLAY TIME: Works with any device with audio output such as a TV, PC, CD Player, MP3/MP4 player, smart phone etc. Can support a connection up to 30ft/10m away and for 6 hours of play time. View More In Network Transceivers. If you have any questions about this product by Avantree, contact us by completing and submitting the form below. If you are looking for a specif part number, please include it with your message.